Wednesday November 13th 1901 We did a big washing and washed a carpet. Will went to the valley for wood. Mollie and I spent the evening visiting, she was down town last night. Thursday November 14th 1901 I took an early start to take Mother down to Aunt Ellens. We stopped at Uncle Jims for some sausage. We had such a nice time only the trip home was pretty cold. I sewed all the evening. Mollie down town tonight. Ida and the boys away. ida is going to work for Mary Price. Friday November 15th 1901 It was a cold windy day. The men warked very hard to finish the buggy shed. I sewed all the times I could get for Ida she is getting her things ready to go out to Marys tomorrow. Saturday November 16th 1901 I sewed most of the forenoon to finish Idas waist. Will took her to town in the afternoon. I did some sweeping and work about the house. 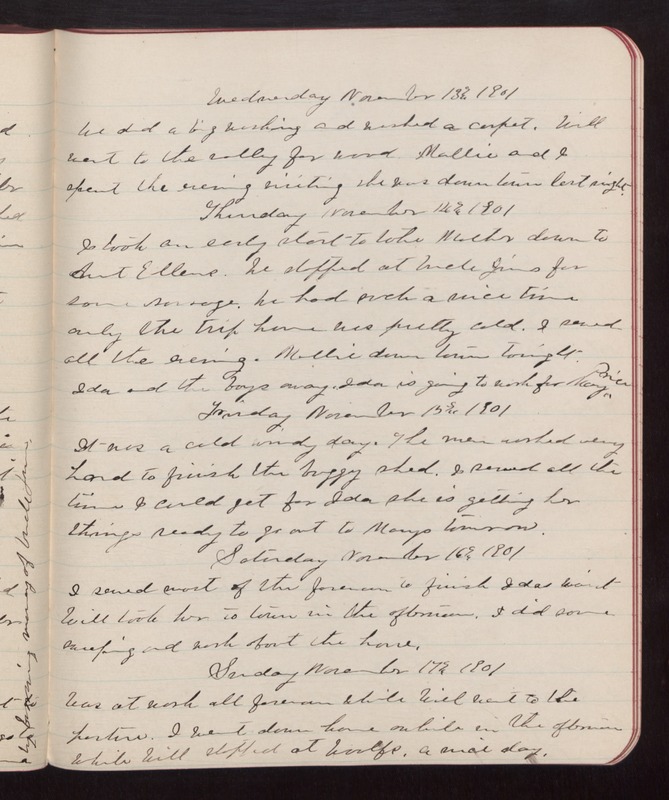 Sunday November 17th 1901 Was at work all forenoon while Will went to the pasture. I went down home awhile in the afternoon. while Will stopped at Woolfs. a nice day.